Just moved into your own space or looking to improve your home? You can head to these markets and stores to find decor, furniture and other knick knacks on a budget. A little handicraft store in Wakad and the brainchild of Aditi Khot and operates the store out of her home. All handicrafts are made by artisans who make it in traditional styles that have been in their families for generations. One of their best selling pieces is the hand-woven floor mat, priced at INR 550 and is part of the mandur weaving tradition of West Bengal. Wall hangings are also made in several traditional styles, and can be yours starting from a very reasonable INR 90. They also have glass pottery and cutlery starting at INR 450. You’ll be spoilt for choice and you’ll be doing a good deed as this is a non-profit store. Add some furniture to your balcony or keep it out on your patio. Perhaps, add some character to your room with a simple cane stool. Cane stools and chairs start at INR 2500 for a pair. Or you could opt for a bigger price, which will set you back anything more than INR 3000. The shop also has cane sofas, lamp-shades and other cane seats and more in different shapes and sizes big and small. One of the oldest markets in the city, Juna Bazaar near Kasba Peth is a treasure trove of everything old, antique and unique. If you’re looking for second-hand wrought iron furniture for your home, head to this place right now! Beds start at INR 1,800, small-sized wardrobes for INR 500 and plastic chairs and tables are priced INR 350 onwards. The trick to get a good deal at Juna Bazaar is to bargain. So bring in your A-game and get yourself new furniture at a handsome discount. 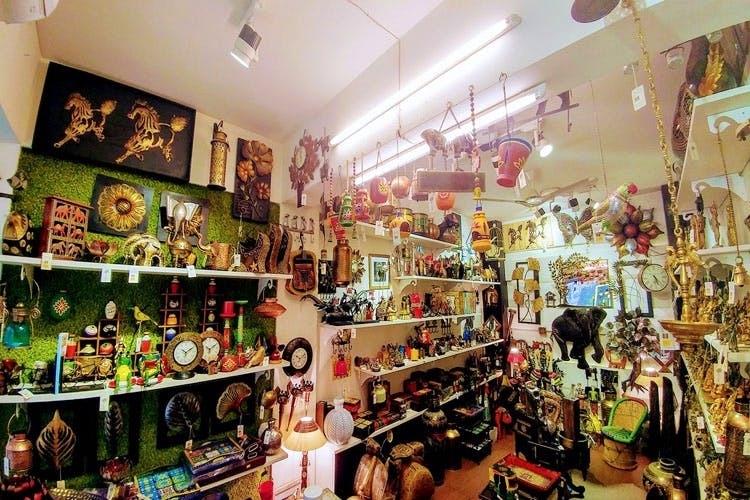 This antique store near Bhopla Chowk in Camp has a range of things you can shop for to add knick-knacks and other decor to your home. The store is a home decor haven, full of things that are handcrafted in brass. Starting at INR 50, there are items that’ll add some personality to your shelf. Their assortment of brass knobs that start at INR 350 is ideal if you want to add an antique look to your home. Dress up your home with pretty fairy lights, lanterns, chandeliers and more. Tapkir Galli in Budhwar Peth is a narrow lane crowded by shops on both sides. Known as the electric market of Pune, you’ll find a collection of fairy lights either in multiple hues or quintessential warm yellow. Since the shopkeepers sell everything at a wholesale rate, you’re sure to get everything for a steal deal. When it comes to cushions, Sharda Cushion Makers is your old-school upholstery store. At a steal, you can buy a cushion and get it’s covers made by the shop’s in-house tailors and upholsterers. They also have ready-made ones in case you have no specific design in mind. Prices start at INR 90.